Fan Friday Giveaway: Win Your Favorite Toner! Which is your favorite toner? Would you like to win it?? Also, make sure to check out this week’s blog highlights! Do you know how to use your skin care regimen? Our little secret for getting the itch out of mosquito bites. We love Audrey Hepburn. See what she said about beauty. *One contest entrant will win their toner. This contest is open to residents of the U.S. and Canada; you may enter to win this contest between August 30-September 2, 2013. We will announce the winner on Tuesday, September 3, 2013. Special Cucumber Lotion is my favorite! Leaves my skin smooth and soft. I got the Glycolic Acid Toner a little while ago and love it. It’s super gentle, but in the same time it manages to do a great job at exfoliating my skin. Love it!!! Hmmm are any of them for sensitive skin? I break out easy. Would love to try one! Thanks! The Cucumber Cleansing Lotion is my favorite! So refreshing! Love the Cucumber Cleansing Lotion, use it every day. Makes my face feel so soft and does not leave a film, just clean fresh skin. thank you for your wonderful products. Have all the ones for sensitive/Rosacea skin tone, they are the best – nothing else except for prescribed medicine work on my skin. I absolutely love the Glycolic Acid Toner. It leaves my skin soft and dewy — it’s amazing that I get these results just from a cleanser. The special cucumber lotion is awesome, I use it in the fall and winter. What is the Alpha Grapefruit cleansing all about?? I love grapefruit! I love the Cucumber Lotion! I use it along with my Enzyme Cleansing Lotion and my skin is so soft afterwards. Love the seaweed cleansing lotion/toner. I love the special cucumber toner ! it works miracles on my face. I have never found products like these that work so efficiently and so gently. I love them! The Gylcolic toner is my HolyGrail I have created so many uses for it one being a toner as well as a component ingredient when doing an extensive face mask treatment for deeper exfoliation when mixed with clay. Aloe Vera Toner is the bomb and my current MB Toner since I’ve been having really dehydrated skin lately. Super soothing and super affective. Plus it doesn’t have ingredients I can’t pronounce =) Thank you so much for this product it’s been a staple to my routine! Cucumber cleansing lotion, so refreshing on your skin. Alpha-Grapefruit Cleansing Lotion is fantastic! Love to win one! Would love to win the Cucumber! I would love to try any of them……thank you! The Special Cucumber is my favorite! I keeps my skin smooth and vibrant!! I’ve tried a sample of the Special Cucumber Lotion and LOVED it! Helped with breakouts and my skin felt great after I used it. Special Cucumber Lotion is awesome! Helps keep my skin clear without drying! Special Glycolic Cleansing Lotion is my favorite because it really helps to keep my skin looking fresh and not accumulating dead skin cells. I have 2 favorites (hope thats ok:) the seaweed cleansing lotion & the cucumber cleansing lotion…Love all of Your Products! I love Mario Badescu products. All products work amazing!! My daughter and I love the glycolic acid toner. I’ve Been using this for more than a year now. I love how this stuff brightens my skin and the dark spots that I used to have. This is the toner that keeps me coming back for more. Love the glycolic acid toner. It doesn’t dry out my skin. After using, my skin feels soft, not tight. Mario Badescu products make my skin look its best! The Cucumber Cleansing Lotion maintains skin’s integrity without disrupting and making me red. I love it so much and have replenished for a few years! This is great in helping combat the gross New York residue left on your face. Make me glow, Mario. I can’t go a day without your touch. I must use all of the things! I’ve been using Mario products for almost 10 years now and I always keep special cleansing lotion c in my closet – it’s perfect for my stubborn skin! The Alpha-grapefruit sounds amazing to me! I’ve used the cucumber toner in the past! I can’t live without the Special Cucumber Lotion! My acne-prone skin gets so upset if I forget to use it and makes sure to let me know. It’s a miracle product for us oily gals! I haven’t tried a toner yet, but I am waiting to get my seaweed one in the mail! I talked to a super nice gal through the Chat Now option on the website, and she listened to all of my questions and matched me up with what I hope are some perfect products for me! I absolutely love the enzyme cleanser, and can’t wait to implement my new toner and moisturizer into my routine 🙂 SO SO SO glad I found Mario Badescu, and I recommend to everyone! I love the Cucumber cleansing lotion. My skin feels so soft and clean after using it. My favorite is the Glycolic Grapefruit Cleansing Lotion. I love the cucumber cleansing lotion! Best thing I’ve used to clear out the hardships of every day for my skin. Thanks Mario Badescu! I forgot to put why I like them. I haven’t tried these from MB yet, but I would really like to try these products out. I got the peptide renewal samples in the mail and I am obsessed! I would love the chance to add the Cucumber Lotion to my MB routine! Special Cleansing Lotion C is AMAZING! I was having trouble with random breakouts and mid-day greasy skin, and this helped keep both at bay while making my skin feel fresh, smooth and soft. One of my best beauty discoveries ever! Seaweeeeeeeed!! I’m never without it! It’s the perfect combination of cleansing and gentle. Special Cucumber Lotion is my favorite as it really soothes my skin! I would love to win my favorite toner, which is the Glycolic Acid Toner. It works well at exfoliating my skin without drying it out. Absolutely love the seaweed cleansing lotion and got my best friend to use it as well! id love the cucumber lotion. itd be so amazing! I love the Special Cucumber lotion, I feel my skin so fresh!! I would love to try the cucumber lotion!! The Glycolic Toner is my absolute fave! It makes my makeup go on so smooth! I more then love the enzyme cleansing gel. It smells amazing and leaves my skin so soft. I love the Glycolic Acid Toner! It always leaves my skin so soft and I love that it’s alcohol free. The bottle size lasts a long time especially because a little amount of the product goes a long way. I’m a huge fan! I love the special cucumber lotion. The Cucumber Cleansing Lotion is my favorite and does not irritate my sensitive skin! Id like to win the cucumber cleansing lotion, please. The Seaweed Cleansing lotion for sure! I love the KERATOPLAST CLEANSING LOTION — it is super gentle on my very sensitive skin. It helps control redness and keeps my skin feeling soft and moisturized. For anyone with rosacea, this works great with the cream soap! The cucumber cleansing lotion is by far my favorite toner of all time! Hands down! My face feels super clean and refreshed when I use it. It’s for sure a must have in my daily skin care routine! GLYCOLIC GRAPEFRUIT CLEANSING LOTION is my favorite toner, only one that works. great product, would love another. I love the Glycolic Acid Toner! It gently exfoliates my skin and makes it look and feel so soft and smooth. Special cucumber lotion is recommended for me from the skin analysis but I have yet to try it. I love the aloe vera toner! My skin has dramatically changed since using it as a part of my daily skin care regimen. I now look forward to washing my face whereas before I didn’t. I like the cucumber cleansing lotion..It makes your skin feel so refreshed! I love love love the special cleansing lotion! It does wonders for my acne! I have always used the Special Cleansing Lotion and love it! I would like to try the Glycolic Grapefruit. Mario Badescu, you my dear, have changed my life. I live off of your skin products especially the Glycolic Toner. It’s so gentle yet makes my skin feel amazing. I NEVER leave home without it. Thank you. Have never used them, but I imagine the cucumber toner would be a great one to try. The seaweed cleansing lotion is my favorite – it makes my skin feels so fresh, clean and smooth! I like the ALPHA-GRAPEFRUIT CLEANSING LOTION. I LOVE the special cleansing lotion c!! My favorite!! I LOVE the special cleansing lotion c! It’s my favorite!!! Helps my acne a lot! I love the Cucumber Cleansing Lotion!!! I have bad acne and it helps a lot!!! The Aloe Vera Toner has to be my fave! I dry out so easily especially when the weather starts to get cold and this feels so soothing and makes my skin so soft and I have hardly any breakouts. Thanks so much for an awesome product! I really love the special cucumber cleansing lotion. I feel like it really pulls the oil and dirt out of my skin while balancing the ph level. Thank you! I love the aloe lotion! I use it everyday! I like theGlycolic Acid Toner. Alpha grapefruit is the bomb! It’s refreshing on these hot summer days. Makes my face feel amazing! I Absolutely Love the Special Cucumber Lotion Whenever I am having mostly hormonal breakouts because it dries them out and prevents other breakouts from forming. I would love to win the Alpha Grapefruit Cleansing Lotion!!! With 3 kiddos, I need all the help I can get to maintain a fresh face!! I love the Special Cucumber Lotion to help keep my face clear. My face breaks out often but most acne solutions are way to strong and leave my skin dry, burning, and red! This toner isn’t too strong for my face and helps my skin stay clear and fresh. I love the seaweed cleansing lotion I got it as a sample a while back and i’m in love it tones my skin without over drying my skin like other brands did ! I love the Glycolic Acid Toner. It leaves my skin soft and clear — it’s have been looking for ages for something like this. Thank you. Special Cucumber Lotion! Smells so fresh and keeps my skin clear. Glycolic Acid toner is my favorite!!!!! Cucumber Cleansing Lotion. it’s amazing. I’d love to win some Special Cleansing Lotion C; my oily skin responds well to sulfur. I love the Seaweed toner! it leaves me feeling so refreshed! Cucumber Cleansing Lotion is my fave! Love the ALPHA-GRAPEFRUIT CLEANSING LOTION. It has such a wonderful smell and leaves my skin so smooth and clean. It also minimized my monthly break-outs. The cucumber cleansing lotion has CHANGED MY SKIN!!!! I’ve just loved it and would love to win a new bottle to replenish my supply!! I am fairly new to the MB line, so far I LOVE all of the products I have tried but I would like to try a toner for oily skin.. I love the Seaweed Cleansing Lotion! Non-drying but helps with my breakouts! I love the cucumber! I recommend it to everyone I can! It is so refreshing and during hot, summer days in the desert it’s perfect! Light and refreshing, leaves my face soft! I’ve never used a toner before. It looks like I would likely go for the cucumber one but what’s it for ? Love the Seaweed Cleansing Toner and will switch once the weather gets drier:) The smell, the feel of my skin, and not to mention the look. I have been getting compliments and wearing less makeup in my 50’s than I have in years! I love the cucumber cleansing lotion the most. I also work at Ulta and I find this is one of the top products that flys off the shelf. i’d love to try the cucumber one, I’m currently looking for a toner that works for me! I need a toner for sensitive skin and usually don’t use any toner. I heard good things about cucumber. May absolute favorite toner (even including other brands) is the Mario Badescu Aloe Lotion. I even use it to remove eye/face makeup! I always recommend it to friends and family because it is gentle and effective. Although it has alcohol in it, I find that it is in no way drying. I love how clean my face feels after using it (not sticky). I even carry around a little travel bottle of it for when I stay with my boyfriend. Can’t live without it! I’m new to this product! I would love to try them all! Special Cleansing Lotion C !!! This is amazing for my oily skin! My favorite toner is the Cucumber Cleansing Lotion. I love the feeling of instant refreshment! GLYCOLIC ACID TONER!!!! Love this toner because it has no alcohol. Very hard to fond toners that do not contain alcohol. This toner refreshes my skin and wakes it up. Love love love it! I love Mario Badescu products! I use the entire line that is for my skin type and have seen desired results! Thank you! I’d love to win! My favorite is the Glycolic grapefruit Cleansing Lotion. It’s refreshing on work well. Alpha Grapefruit toner is my favorite. I received my first order and I’m in love already, I chose the cucumber cleanser as one of my trials and regretting I didn’t order a full bottle. My face doesn’t feel dry after using it and I love the smell. I’m definitely hooked! I love the cucumber toner! It unlike so many products works but does not irritate my somewhat sensitive skin. I like to use the Glycolic Acid Toner to purify my skin, which is a bit oily and can get clogged, even though I am an older gal. However, for daily use and refreshing, I absolutely LOVE the Facial Spray with Aloe, Herbs and Rosewater! It helps my MB moisturizer glide on and absorb nicely. It’s a great pick-me-up, too, especially in this hot, humid weather. I am a new fan! Recently started using the Glycolic Cleanser & Toner and I love love them. Would love to try something to cleanse/tone for everyday use. I also love the Vitamin C Serum! MB, your Aloe Lotion is my favourite! I use the Glycolic Acid Toner and I love the fresh clean feel it leaves on my skin! Mario Badescu products are the best. I’d love to win this toner! Thanks for the chance to get one! I absolutely love my cucumber cleansing lotion! It makes my skin feel extremely soft and clean. I struggle with acne and since using this product along with other mario badescu products I’ve noticed a significant difference. I love to pair it with the silver powder! The cucumber lotion is amazing – makes my skin feel so smooth. I love the Alpha Grapefruit when I need to exfoliate and the keratoplast when my rosacea is more pronounced. Today’s my birthday and I’d love a free toner! Glycolic Acid toner! Amazing on my skin. The Special Cucumber lotion is AMAZING! It’s one of the few toners that leaves my skin feeling completely clean without the harsh burn or stripping if the skin. My skin is addicted to this stuff! If ever I run out or miss a day, I can see and feel a difference. My Holy Grail toner for sure! I tried the samples peptide renewal & serum. this is a fantastic product. even better than obaji, which I have used. I have very sensitive skin and most everything makes me break out.. This one is fantastic and leaves skin feeling soft and clean.. never greasy or irritating. I love the Alpha-Grapefruit Cleansing Lotion! It’s gentle enough so it takes off any excess dirt or oil without feeling like it’s stripping my skin! I would have to say the cucumber toner is fantastic not sure I could go without it. I have only tried a few of the toners but so far the cucumber is my favorite. I don’t have a toner. I love how clean special c makes my skin feel!!! Coincidence—-I was just putting an order together. I believe taking care of your skin is an integral part of your body’s health and mind wellness; this is a staple for me. I believe Mario Badescu’s line is one of very few, who has figure out how to keep your skin looking natural and healthy. The cucumber cleansing lotion—visually see how clean, feel how fresh, and know you did the right thing! Absolutely LOVE LOVE LOVE the cucumber cleansing lotion!! I love the Seaweed Cleansing Lotion, it calms my skin when my hyper-sensitive skin starts acting up due to allergy’s or occasional hormonal breakouts. I really like using the Cucumber Cleansing lotion. It leaves my skin feeling refreshed and helps control my oily t-zone. Tone it up with Mario Badescu products! My favourite is the cucumber lotion. It cleanses and makes my face fresh. It also helps fade my dark spots. Great product!!! Love the cucumber lotion. Skin feels great? Would love to win some seaweed cleansing lotion! Cucumber Cleasing Lotion. It does not give my sensitive skin a reaction. Seaweed Cleansing oil keeps my fresh smooth and clean! I like using the special cucumber lotion, as it makes my skin feel clean after using it. Thank you. I LOVE the Special Cucumber Lotion. It helps clear and clean my combo skin without stripping it or leaving any oily residue behind. I have been without this, my favorite toner, for a time now and it shows on my face 🙁 I use the Enzyme Cleansing Gel, the Ceramide Herbal Eye Cream and the Oil-Free Moisturizer to round out my routine. Thank you MB for being so fantastic! I’ve never tried this brand but it caught my attention. I would love to try the seaweed cleansing lotion. I think I will like this one because I enjoy facials with actual seaweed. I love the chamomile cleansing lotion. I have very sensitive skin and it can be very rosy. It has helped keep my skin calm and smooth. I LOVE it!!! I love the Cucumber Cleansing Lotion. It gets my skin so clean and never over dries! My Favorite Toner has to be the Cucumber Cleansing Lotion, it’s helped with my stubborn/oily T-zone and Clear Up any existing acne. MB’s Special Cucumber Lotion is my fave! It keeps my breakouts to a minimum and has really tightened my pores! 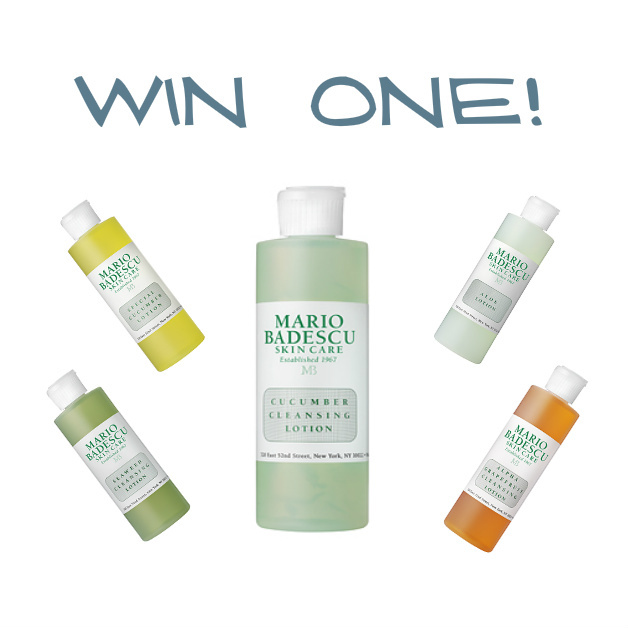 I’d love to win a Cucumber Cleansing Lotion! My fav is Special Cucumber lotion. Glycolic Acid Toner! I’d love to try it. I’ve never tried any of your products before…so I couldn’t say. Thanks for the opportunity! I would like to try the Aloe Vera Toner–it sounds perfect for me! Thanks! alpha grapefruit cleansing lotion caters to my sensitive skin, while also helping my pigmentation. love it! I love the glycolic acid toner! My daughter turned me on to it and she was so right. I love the Glycolic Grapefruit toner. I notice since I’ve been using it, it has been shrinking the pores around my nose and reducing the blackheads I usually get. Loves it! I love the Glycolic Acid toner, but would love to try the Alpha Grapefruit or Seaweed toner. There are just so many great toners it was hard to choose. I swear by the Aloe Lotion! My skin feels so soft and clean after I use it and it is not harsh like other brands’ toners that I have used. The Aloe Lotion is soft and gentle and evens out my skin tone! I’d love to win more of it! My Favorite is Cucumber Cleansing 🙂 LOVE IT! LOVE LOVE LOVE the Cucumber Cleansing Lotion!!! The Cucumber Cleansing Lotion is my holy grail! Never knew what I was missing out on until I gave this product a try. My skin has neither looked better nor felt cleaner than it has since using this toner. Thanks, MB! I recently introduced Mario Badescu line to my skin regimen, it is amazing. I use the facial gel, and the facial spray with Aloe, great pick me up. Still exploring everything but I love it so far!! I have tried so many of the toners! I started with the Glycolic acid toner, and then use the seaweed cleansing lotion alternately. The Seaweed toner is very gentle and cleans my skin, but I want to try something a little more strong for everyday use with gentle exfoliation. I have also tried the Special Cleansing Lotion O for bacne. I would really love to win the Alpha-Grapefruit Cleansing lotion! I think it would be a great match for me. chamomile Cleansing Lotion is my favorite. It would be great to win a bottle. Toner please. It will be very much appreciated. Love the seaweed toner! It’s gentle on my sensitive skin but keeps my skin clean and clear! Alpha Grapefruit. I would love to try it. I totally love how MB products help me to avoid stubborn pimples.. My pimples are primarily a result of my hormonal imbalance due to PCO. I have been using the acne facial gel, drying lotion, and buffering lotion as part of my regimen for almost a year now… Would love to try the glycolic acid toner, as I’ve learned that it’s good for brightening the complexion and in fading the scars. I love the cucumber, so gentle on sensitive skin, yet so effective. I swear by special cucumber lotion… it helps keep my skin clear! I was never a believer in toner, that is, until I tried your Special Cleansing Lotion “C”. I’ve struggled with breakouts as long as I can remember, but since I’ve been using this (almost two years now), I’ve finally got things under control. Love it!!! The Cucumber Cleansing Lotion keeps my skin soft and smooth as a baby’s bum! Love it! I Love the cucumber and the seaweed lotion, they smell so good and make my skin feel so smooth!!! LOVE the Special Cucumber Lotion. It has done amazing things for my skin, I’ve recommended it to so many people! Seaweed cleansing lotion is the best thing that ever happened to my face. My pores have reduced significantly; my face is a lot more clear and even toned. On the plus side, it is sulfate and alcohol free. Thank you for creating such an amazing product! I like the GLYCOLIC GRAPEFRUIT CLEANSING LOTION because it makes my skin more radiant. I love the glycolic acid toner!! It works very well on my skin! Glycolic acid toner for removing dullness. Cucumber lotion is the best…. I love the enzyme cleansing gel & have used it for years on my sensitive skin. It is one of the few products that will not irritate my skin. Grapefruit glycolic cleanser has been a savior to my skin! I love the glycolic toner!!!! Cucumber hands down, use this one all the time! I love the cucumber lotion. It doesn’t make my skin feel tight but still feels super clean and acne free! I was sent the Aloe Lotion sample as part of my skin care assessment regimen and have been using it over a year now. It does it’s job without drying my face out. I let my daughter (age 23) try mine and now she wants to start using Mario products. I absolutely love the Cucumber Cleansing! I’m a girl with sensitive skin and have definitely tried them all! I’m happy to say my experience with the Cucumber Cleansing Lotion has been nothing short of excellent. I love using this in my daily skin care routine! Would be happy to win this prize! I love the cucumber cleansing lotion! All of Mario’s products are awesome, but I have not yet the cucumber lotion and I hear so many good comments about it. I am a BIG FAN, so please let me try some more of your magic products!!!!!!!! Grapefruit Cleansing Lotion and the cucumber!! Aloe lotion all the way! !